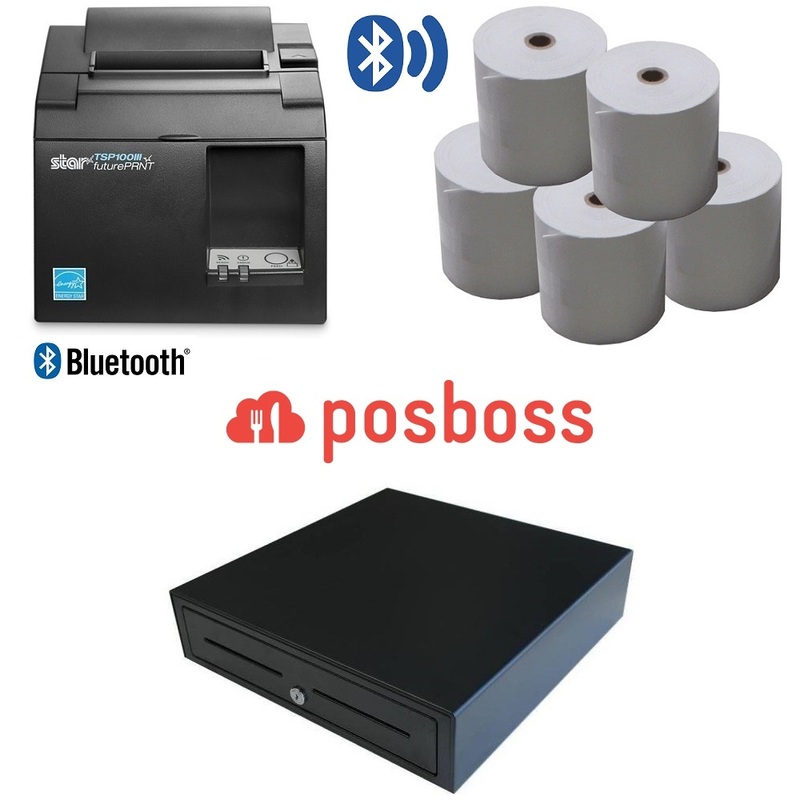 posBoss POS Hardware Bundle 3 - Star Micronics TSP143IIIBI Bluetooth Thermal Receipt Printer, Heavy Duty Cash Drawer and Box of Thermal Paper Rolls. Split the payment over 13 weekly payments of $64.23 Shipping & returns info Free shipping! posBoss Bluetooth Point of Sale Hardware Bundle compatible with possBoss iPad Software. It includes the Star Micronics TSP143IIIBI Receipt Printer with Bluetooth Interface, Heavy Duty Cash Drawer and Box of 80x80 Thermal Receipt Rolls (24 Rolls). Compatible and supported by posBoss iPad POS Software, this Hardware bundle connects directly to your iPad pairing via Bluetooth. This option is simple and doesn't require any cabling. Check out the below details for individual product specs. STAR TSP143III BLUETOOTH Thermal Receipt Printer (TSP143IIIBI-GRY). Star's unique futurePRNT software has also been included. This features easy-to-use instant coupon and voucher software tools. posBoss POS Hardware Bundle 1 - Epson TM-T82II Ethernet (LAN) Thermal Receipt Printer, Heavy Duty Cash Drawer and Box of Thermal Paper Rolls. 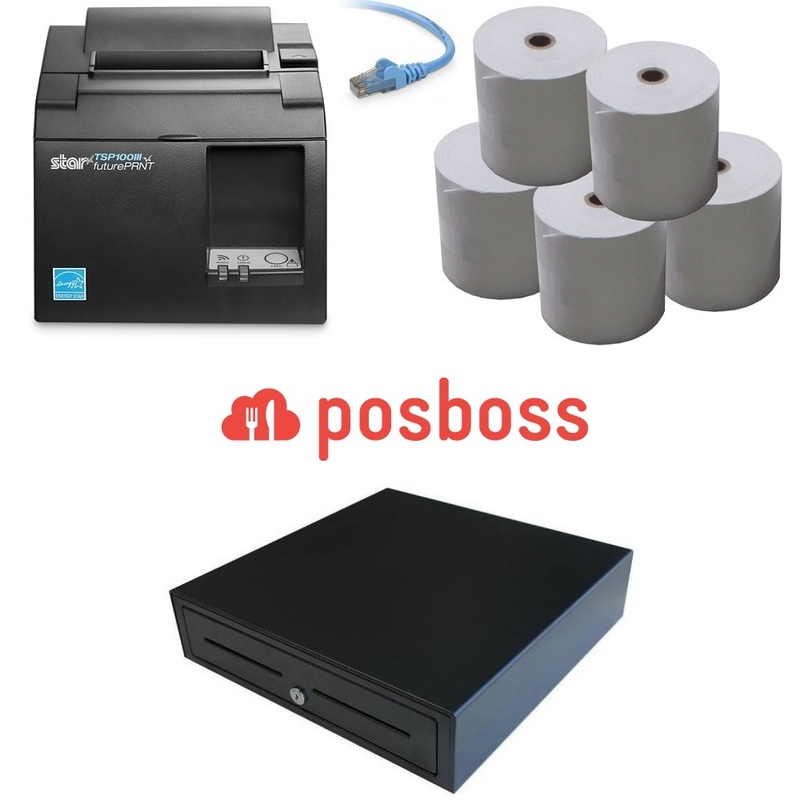 posBoss POS Hardware Bundle 2 - Star TSP143III LAN / Ethernet Thermal Receipt Printer, Heavy Duty Cash Drawer and Box of Thermal Paper Rolls.